In order to explain the Beta-decay process, Wolfgang Pauli discusses an undetectable, mass less particle that assists in carrying away energy. Enrico Fermi names it the neutrino. Particle Physics defines the neutrino, and the solar model depends greatly on its existence. After all, if fusion is occurring within the core of the Sun, neutrinos are a natural by-product. The first experiments in detecting the neutrino is successful, and John Bahcall and Ray Davis predict the number of neutrinos emanating from the Sun, and build an experiment to test the theory. The results are problematic. Only one third of the neutrinos predicted are detected by this first neutrino telescope. Continual study yields the same result. Other detectors are built some time later only to confirm the result. Is the Solar Model incorrect? Does something happen to the neutrinos? Is it a question of detector sensitivity? With continued observation, only very recently have these questions been answered. The most recent neutrino telescope, the Sudbury Neutrino Observatory, has released data that solves the Solar Neutrino Problem. While the Solar Model is preserved, now the Standard Model is challenged. As with all things, there is a beginning. The year is 1931, and Wolfgang Pauli explains the Beta-decay process for the first time. In radioactive decay, a neutron breaks down into a proton, electron, and missing energy. This process is called the Beta-decay (ß-decay). This missing energy is carried away by an unseen, mass less particle that Enrico Fermi later names the neutrino [R2]. Particle Physics is born. This detector is filled with 400 liters of water and cadmium chloride, and measures the interaction between neutrinos emanating from the nuclear reactor and a proton within the nucleus of the cadmium atom. The neutrino interaction was captured by photo-detectors as a flash of light lasting just a fraction of a second [R5]. The experiment was a complete success, and the neutrino was detected for the first time. The bottom two rows belong to the Generation II and Generation III group, consecutively. The first row are Generation I particles. Protons and neutrons are a combination of three ‘up’ and ‘down’ quarks. The electron is a fundamental particle along with its partner, the electron neutrino. 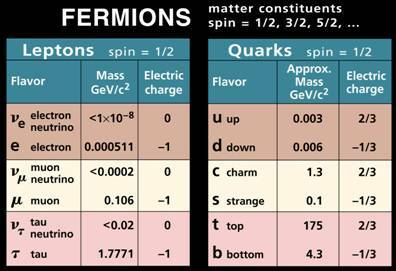 According to the Standard Model, particles in the Generation III column decay to the Generation II column. Likewise, the particles in the Generation II column decay into the particles in the Generation I column [R6]. In other words, the tau particle decays to a muon particle releasing a tau neutrino. Likewise, the muon decays to an electron releasing a muon neutrino. This is important to remember as this will be challenged later by the solar neutrino experiments. What does the Standard Model say about neutrinos [R10]? Neutrinos have very little or no mass. There are three “flavors:” Electron neutrino, muon neutrino, and tau neutrino. Neutrinos have no electric charge. Neutrinos have a spin of ½. Neutrinos have weak interactions, meaning they can pass though the Earth unimpeded. Neutrinos have an associated anti-neutrino that spins opposite, with the following rule: a neutrino spins left and an anti-neutrino spins right. Two Hydrogen protons are fused to create deuterium (2H), a positron (e+), and an electron neutrino (νe). The positron annihilates into an electron and creates two gamma rays. A single Hydrogen proton is fused to the newly created Deuterium and creates a light isotope of Helium (3He) and a gamma ray. Two of the light isotopes of Helium are fused to form the “normal” Helium atom and two extra Hydrogen protons. This entire process provides 85% of the supplied neutrino flux. Helium and light helium fuse to form beryllium (7Be+) and a gamma ray. Beryllium adds an electron to form lithium (7Li), and releases an electron neutrino. The lithium adds a photon of hydrogen to split to two helium atoms. This entire process releases only 15% of the neutrino flux. Light helium and helium fuse to form beryllium and a gamma ray. The beryllium fuses to a hydrogen proton to create boron (8B) and a gamma ray. The boron is unstable and releases an electron and an electron neutrino to become beryllium once again. The remaining beryllium continues to remain instable, and breaks apart into a pair of helium. This entire process only releases 0.02% of the total neutrino flux. This is the solar model in its entirety. Based on the above predictions of neutrino flux, John Bahcall and Ray Davis begin to construct the first experiment to detect solar neutrinos. To build such a detector, a location needed to be found, and a medium in which to capture the neutrino needed to be selected. Since neutrinos have weak interactions, they can pass straight through the Earth with little difficulty (Kitchin, page 149). On the other hand, other radiation cannot travel though the Earth. The perfect location for any neutrino detector is deep under the surface. The choice for the first neutrino detector was Homestake gold mine in South Dakota. 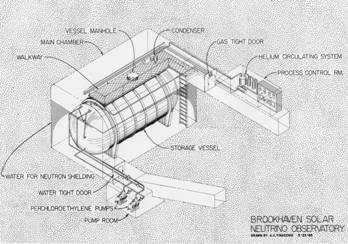 As suggested by Bruno Pontecorvo and Luis Alvarez in the 1940’s [R2], a chlorine solution was chosen to capture neutrinos. Since such a large amount of liquid (600 tons) was required, a relatively inexpensive chemical was chose. Standard dry-cleaning solvent (tetrachloroethene) was perfect since it was available in such large quantities. The results proved that neutrinos emanating from the Sun do exist, but the number of neutrinos detected here on Earth, called the flux, was one-third the number of predicted neutrinos. Could the model of solar fusion be incorrect? Could the method of detection be incorrect? For more than two decades, the answer to the Solar Neutrino Problem remained unsolved. Realizing the possibility that sensitivity might be the cause of the problem, two experiments were designed to detect neutrinos of a lower energy. These detectors are identical in their design, but different in overall capacity. By counting the radioactive atoms of germanium, the neutrino flux is calculated. An identical experiment in Italy, called GALLEX (GALLium EXperiment), used only 30 tons of gallium. Both of these experiments, although more sensitive, supported the Davis experiment by only detecting 50 to 60% of the neutrino flux [R8]. Two other detectors using water as the media, while originally designed to examine proton decay, proved successful in detecting solar neutrinos. 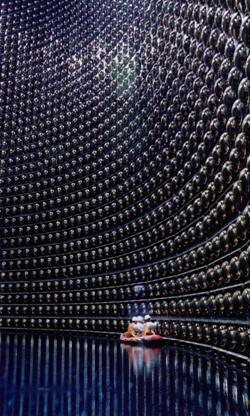 The Kamiokande and the IMB (Irvine-Michigan-Brookhaven) detectors are underground water tanks lined with a tremendous number of photomultiplier tubes. The Kamiokande weighs in at 3000 tons while the IMB weighs in at a tremendous 8000 tones. Because of this design, there is an added benefit: the direction of the neutrino interacting with the water molecules can be tracked. The positron (e+) is released in the same direction of the neutrino, with a speed in excess of the speed of light in water – which is 225,000 km/s (Kitchin, page 153). This creates an optical shock-wave called Cherenkov radiation. These effects are counted to determine neutrino flux. The sensitivity of both detectors was enough to study the flood of neutrinos emanating from a supernova – SN1987A. While sensitive in their ability to detect neutrinos from such a distance, the measure of the solar neutrino flux agrees with all previous solar neutrino experiments. With the added benefit of determining the direction of the neutrino, solid evidence was presented that the source is indeed the core of the Sun. In order to further increase sensitivity, the groups responsible for Kamiokande and IMB joined forces to design and build the Super-Kamiokande Neutrino Observatory. 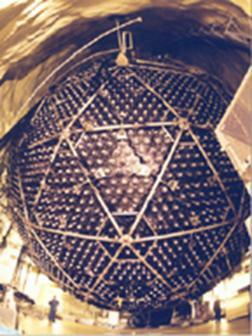 Based on the success of the previous water-based experiments, the Super-Kamiokande contains and enormous 50,000 tons of water. In the shape of a cylinder, photomultiplier tubes line the inside cylinder wall, the floor, and the ceiling of the detector. With such a large capture area, this detector was able to detect muon neutrinos emanating from the Sun. While the results still counted only 55% of the total neutrino flux, the detection of the muon neutrino gave the first clue that neutrinos might be oscillating [R10]. In a sad turn of events, tragedy struck the Super-Kamiokande detector on November 12, 2001. A single photo-detector imploded creating a shockwave that damaged several thousand photo-detectors. The damage was repaired, and the detector has begun operations on January 18, 2003 (http://dumand.phys.washington.edu/~superk/. Gaining perspective: The results so far. Over 20 years have spanned, and a solution to the Solar Neutrino Problem has not been found. However, the technologies have improved and the culmination of these results will lead to a final solution. The core temperature of the Sun is 10% less that the predicted value. Something is happening to the neutrinos between the Sun and Earth. Neutrinos may be oscillating between flavors. While a 10% reduction in core temperature would agree with the predicted neutrino flux, other effects would follow. For example, a 10% reduction in core temperature would conflict with Wien’s Law – or the relationship between wavelength and temperature (Universe, page 101). Since neutrinos are weak interactive particles, there is little to affect their trajectory, so something happening to the neutrinos between the Sun and Earth is highly unlikely based on the Standard Model. The idea that neutrinos oscillate, that is change from electron neutrino to muon neutrino to tau neutrino at random, has gained favor since the Super-Kamiokande was able to detect a muon neutrino coming from the Sun. The Sudbury Neutrino Observatory would support this idea [R10]. The Sudbury Neutrino Observatory, or SNO, is built deep underground in Creighton mine in Sudbury, Ontario. This observatory is different from the other neutrino detectors as this one uses heavy water, and is actually capable of detecting all three “flavors” of neutrinos [R9]. The detector consists of 1000 tons of very pure heavy water in a 12 meter sphere. This sphere is enclosed in a clear plastic sphere 22 meters in diameter and is suspended by ultra-pure regular water. Surrounding that sphere is a geodesic sphere containing over 9000 photomultiplier tubes [R9]. Just like the Kamiokande, IMB and Super-Kamiokande detectors, the SNO is looking for the Cherenkov radiation emitted by neutrino interactions. The results as of June 2001 show that the total number of all neutrinos matches the predict flux first theorized by John Bahcall. According to this experiment, the Solar Neutrino Problem has been solved [R3]. In order to test and repeat these results, the SNO performed another experiment called “Day versus Night.”. Basically, the observatory wanted to rule out any possibility of additional radioactivity that could have skewed the result. The results released in April 2002 matches the initial result in 2001. In addition, the number of electron neutrinos counted by this experiment totaled 1/3 of the total number of neutrinos. This is proof that oscillation is occurring between all three “flavors” of neutrinos [R9]. The total number of neutrinos detected equal the total of neutrinos predicted. The Solar Model is correct – fusion is the source of energy within the Sun. Neutrinos oscillate between electron neutrino, muon neutrino and tau neutrino. The increased sensitivity of SNO allowed detection of all three neutrinos. All three “flavors” of neutrinos are detected emanating from the Sun’s core. According to the Standard Model, neutrinos are released when their companion particle decays towards the Generation I particle. According to SNO, neutrinos oscillate between “flavors” indicating that neutrinos have mass. The Standard Model states that neutrinos do not have mass. Other elements are believed to be even more sensitive in detecting neutrinos. While such telescopes are yet to be constructed, Iridium, Lithium, and Potassium-Hydroxide are thought to provide a more sensitive media, but cost and availability could hinder such projects (Kitchin, page 155 to 157). So far, our current ability to detect neutrinos is only possible from the Sun, supernova, failed supernovae, and know Gamma-Ray Bursts (GRB’s). 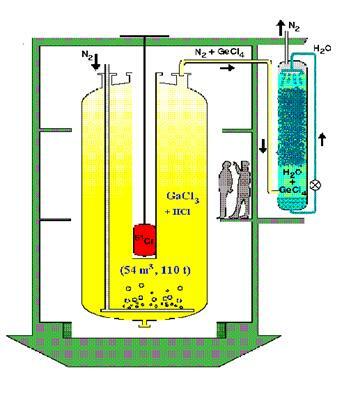 It is thought that this reaction is stable enough to allow real-time analysis of a neutrino. The sensitivity of this detector will allow the study of the least energetic neutrino, the ones from the initial P-P chain [R11]. The study of the neutrino is an excellent example of the scientific process. An idea is proposed to explain a process – in this case, an explanation was proposed for the ß-decay. A theory is formulated and experiments are designed to test the result. Neutrinos were invented, theorized and later proved by experimentation. A model (which is a theory with a design that is accepted) of energy production within the core of the Sun was also tested by experimentation by detecting neutrinos. While the initial flux did not match theoretical limits, the experimentation continued. Improvements in detector design allowed more sensitive measurements, and the persistence in testing ultimately resulting in detecting the theoretical flux. The Solar Model was proven to be correct: hydrogen protons are fused together to form helium with a release of energy and neutrinos. Also in the spirit of the scientific method, other observatories are designing alternate versions of neutrino detectors to continue studying them. Just as the experimentation to prove the existence of the neutrino led to neutrino detectors to study the fusion process within the Sun, new designs in neutrino detectors may allow studying neutrinos from other sources such as: gamma ray bursts, supernova, and cosmic background radiation. Perhaps these new detectors will allow us to see the theoretical neutrinos as an ingredient to Dark Matter. In the mean time, Astronomers can now cross the Solar Neutrino Problem off their lists. [R2] Boyle, Alison and Grimes, Ken. “Ghostbusting the Universe.” Astronomy Magazine December 2003: 44 – 49. [R3] Foust, Jeff. “Solar Neutrino Problem Solved.” Spaceflightnow.com. Online June 20, 2001. Kitchin, C R. Astrophysical Techniques: Third Edition. Institute of Physics Publishing, Bristol and Philadelphia, 1998. [R6] Quinn, Helen. “Theory. Leptons.” Virtual Visitors Center. Online. 05 May 2003.